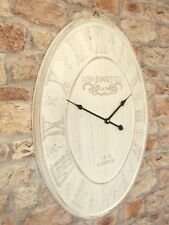 A stunning Oval wall clock with a retro antique shabby chic design. On the Face of the Clock are the raised words 'Kensington Station, 1870 London'. 60cm high x 45cm wide. Depth 1.5cm. THE CLOCK HAS BEEN GIVEN A DISTRESSED AGED SHABBY CHIC FINISH.IT IS A DARK BROWN/BLACK AND MADE TO LOOK RUSTY AS SHOWN. THIS A LOVELY LARGE OVAL WALL CLOCK. *PLEASE CLICK 'READ MORE' BELOW FOR DETAILED DESCRIPTION OF THIS PRODUCT* Established over a decade, Distinctively French carefully sources and supplies a wide range of unique homeware and gifts from around Europe. We have a wide range of Table Lamps, Tin Signs, Shelves, Vases, Ornaments, Clocks, Candlesticks, Door Hardware, and many other stylish decorative items for your home. With an emphasis on quality products and excellent service, you can trust us to help furnish your home or deliver that valuable gift to someone extra special. OLD TOWN CLOCKS. Size: 68cm high x 50cm wide. We have lots more. Takes x1 AA battery. favorites list ! 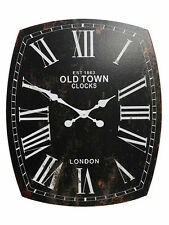 The clock has painted distressing all helping to create a mock antique, aged look.It is made to look old. RETRO SCOOTER WALL CLOCK. SCOOTER RIDER. FOR MORE SCOOTER RELATED. WALL CLOCK. This clock is exclusive to parka print, you will not find it elsewhere. & NORTHERN SOUL. Housing: Metal, light blue with rust stains Decorative print "Bistro" white, red, blue, Digits: Arabic numbers, white Fasteners (not included) Width x height x depth in cm: 49 x 39 x 0,4 . 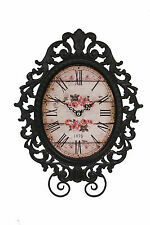 Product type: Wall clock Material: Metal Decorative print "Repair", vintage Colors: Multicolor Digits: Arabic numerals . Product type: Wall clock Material: Metal Deco print 'Beer', beer glass Colors: Multicolor Digits: Arabic numerals . Decoration-Print "Bistro" white, red, blue. With this watch you give your wall a new flair. 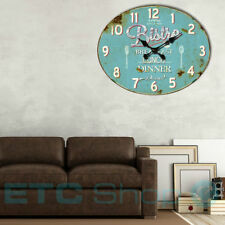 The Shabby look and the "Bistro" print make this wall clock a real sight. • Decoration-Print "Bistro" white, red, blue. OLD TOWN CLOCKS. Size: 68cm high x 50cm wide. We are renowned for our original collections of Interior Accessories-. Cash can be paid but only when the item is collected in person. (GBP only). Takes x1 AA battery.